Pareto analysis follows the Pareto principle. In basic terms, this principle states that in all situations, 80 percent of problems come from 20 percent of causes. Conversely, and more importantly for our purposes, 80 percent of a problem’s resolution comes from 20 percent of the fixes. The challenge is to determine which fixes fall in that 20 percent. Write down a list of all the customer problems that you need to solve. For each problem, identify its root cause. Score the problems and root causes in terms of the level of their impact. The scoring parameters to use depend on the sorts of problems you have. For example, you may score each problem based on its financial impact, its financial cost, its impact on customer engagement scores, or some other measure. Use a simple three-point scale to prevent analysis paralysis, where 3 = high, 2 = medium, and 1 = low. This approach works just fine in most cases. Compare the scores for each problem. The problem or root cause with the top score should be your highest priority. Fixing this problem will yield the most benefit. In contrast, the problem with the lowest score should be the lowest priority. Start tackling the causes of the problems. Deal with the top-priority problem (or group of problems) first. Here’s an example of how this might work. Suppose you want to improve the customer experience at your call center. Your first task is to identify the problems at the call center — for example, by conducting a customer survey. Say the survey unearths two main problems: customers being frequently disconnected or unable to get through, and customers perceiving agents as being rude. Next, you use the Five Whys technique to identify the root causes for each problem. For the first problem, these might include such causes as “too long to answer,” “confusing IVR menu,” and “too many transfers.” For the second problem, the root causes might be “unfriendly employee” and “employee wants to end call.” Then you should score each of these root causes in terms of its relative impact to your organization. Finally, you add up the number of complaints in each category and then calculate each category as a percentage of the whole. 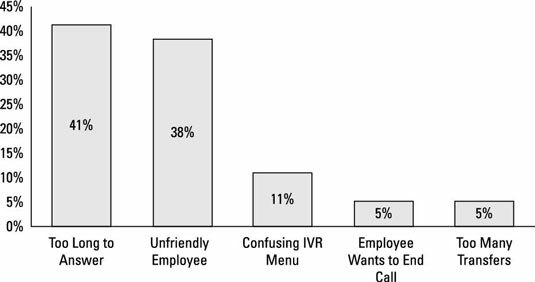 Pretty quickly, you’re able to deduce that “too long to answer” and “unfriendly employee” are the cause of more than 78 percent of all complaints. With just this simple exercise, you can see where you should be focusing your problem-resolution efforts.